Finally found a website for 71 - 73 mustangs. I have been posting on other sites for a couple years but I do not get a lot of help from those folks. Here is a little history on what I have. I obtained a 71 Grandé a few years back that was in fair shape but restorable. I was able to get it and a title for just hauling it away. The motor and transmission had been taken out and sold. Everything else was there except the engine bay was pretty well stripped. I have replaced the driver and passenger floor pans and toe boards. Installed a couple fender aprons and started repairing the cowl. I have since moved to the rear of the car and removed the trunk floor and tail light panel. 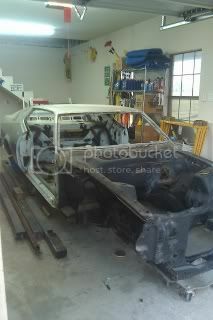 I am in the process of welding in the trunk floor. In my excitement of tearing out the rear of the beast I forgot to get a couple measurements. I need the measurement from the trunk floor to the top of the tail light panel. I probably need a middle and two near the end to be safe. I was wondering if I aligned the bottom flange of the tail light panel with the rear crossmember flange would it be correct? I just need to make sure I get the tail light panel installed correctly. Any help will be appreciated. I will try to post some photos when I get some good ones. Oops. Sounds like you got carried away with the strip down. Been there. I am not near car now since I am at work so if you don't get an answer before I get home I'll get it for you. tx-skydiver;10866 Wrote: Oops. Sounds like you got carried away with the strip down. Been there. Welcome to the forums! Glad you finally found us! 72hcode had a good thread on this also and a couple more members also. Will search here when I get home. If you have not done it yet go to the introductions thread and let everyone know who you are so you will get a proper welcome. Have you decided whether you are planning on restoring or modifying? If you have not already done so, you might want to consider ordering the "Marti Report" as they may influence your approach. However you proceed, I am sure you will find supporters here on the Site. I look forward to interacting with you on the Forums.